EraGem Blog: Are You a Modernist Bride? Choosing a style for your wedding can be difficult. Asking questions about yourself is an important place to begin. In addition, having a wide range of knowledge about customs and traditions can also help. Another thing that can help is to pinpoint your particular art/design style. Studying works of art, both jewelry and non-jewelry, can help you determine your particular style. Your wedding will be a unique opportunity to explore what tantalizes you and your partner aesthetically. We believe that knowing which art styles you love will help you determine which style to choose for your upcoming wedding. In our new series, What's Your Style, we will introduce a number of different artistic styles, offering a several lists and questions to help you determine your particular art style. We hope this helps you make more informed decisions as you prepare for your big day. Modernist art includes artistic works produced during a period extending from the 1860s to the 1970s. The term 'modernist' is usually associated with art in which the traditions of the past have been thrown aside in a spirit of experimentation, with an added dash of shock value. In truth, there may come a time when modernist art forms defy the denotation of a span of years. In every era, there seem to be those who want to throw out the old and embrace only what's new and original. This is the hallmark of a Modernist. A Modernist Bride finds her inspiration in works of art crafted by Henri Matisse, Wassily Kandinsky, Pablo Picasso, and Frida Kahlo. Quintessential works a Modernist Bride will contemplate for her color palette, dress, and jewelry might include The Persistence of Memory (Dali), Three Women (Fernand Lger), or any of Frida Kahlo's self-portraits. As you plan for your big day, are you constantly rejecting the classic color palettes, designers, and wedding venues? Do you find yourself irritated by traditions of past centuries? Do you wish to turn some of the traditions on their heads? Would you like your dress, your hair, your jewelry and accessories to make a statement? Do you want that statement to say: We will do this our own way? If you said yes to any of these questions, then you might be a Modernist Bride. Serve dinner on fancy plastic ware instead of China service. Embrace new materials for her dress; perhaps latex or acrylic instead of satin and lace. Wear her flowers on her shoes instead of carrying them. Carry thorns and thistles instead of roses and carnations. Wear large, chunky Bakelite jewelry in lieu of Edwardian diamonds and platinum. Wear red instead of white. Choose to shout her vows instead of say them softly and romantically to her partner. Wear a wood, tin, brass, or other base-material wedding band. Mount her engagement diamond upside down in her ring, or wear a plastic diamond ring instead of an authentic diamond ring. Perhaps a Modernist Bride might choose a gaudy vintage cocktail ring instead of a traditional engagement or wedding band. Perhaps that ring will make a statement, like this featured Neda Behnam cocktail ring. Whereas many Victorian brides chose serpents for their rings, I don't know of anyone, famous or ordinary, who has chosen to wear a monkey ring every day. This would indeed make some sort of modernist statement. Another option for the Modernist Bride would be to ask her favorite jeweler (pick us! pick us!) 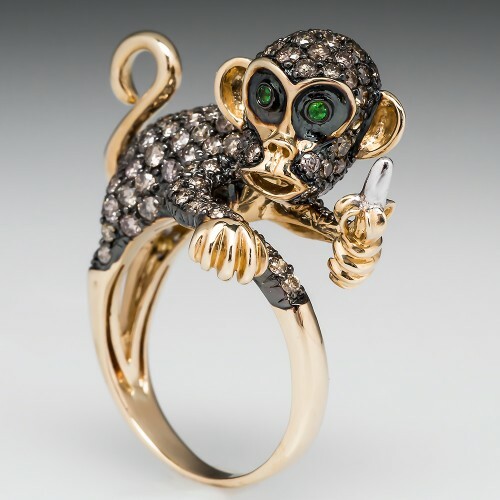 to convert a flashy or sassy brooch into a finger ring for the occasion. Perhaps a Victorian mourning brooch, complete with someone else's hair, or a Lover's Eye ring or locket. It would certainly prove shocking when you people that this symbol of death or illicit love is your wedding ring. So, does the Modernist label fit you? If so, here are a list of other considerations to make as you plan for your big day:.